I make pizza every Friday night. It’s become so much of a tradition for us that the employees of the shop where we buy our dough recognize us when we come in on a Friday afternoon. “Four pizza doughs, right?” they ask. 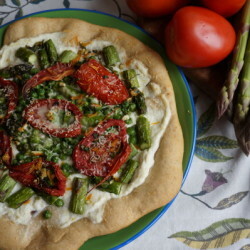 I make four pizzas, or two pizzas and one larger, thick-crust focaccia-style pizza, and then we enjoy leftovers all weekend. 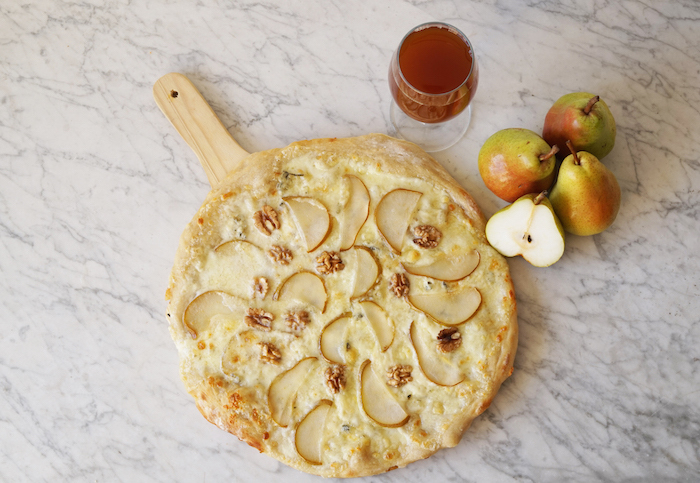 The recipe I’ll share below was inspired by a pizza I ate in Northern Italy – it was topped with fresh mozzarella, gorgonzola, sliced pears and walnuts. Both hazelnuts and walnuts are popular in Northern Italian cuisine because it’s a huge region for growing these tree nuts. 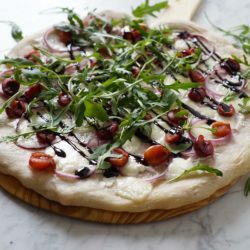 I know that two of these main ingredients can be controversial as pizza toppings – you either love or hate blue cheese or fruit on pizza. I obviously love both. 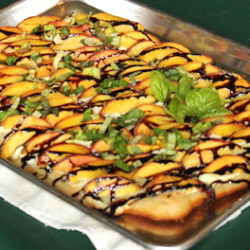 My husband likes fruit on pizza but isn’t too keen on blue cheese, so sometimes I make it with goat cheese instead. I’m sure it would be equally delicious with a cheese like fontina or gruyere too. This season’s pears have been great and while pick-your-own pears will wrap up this Saturday, there will be plenty of varieties in the market to choose from! Current varieties, as of 9/28/17, are Bartlett, Sunrise, Gem, Bosc, Seckel and Magness. Place a pizza stone (if you have one) in the oven and pre-heat to 500 degrees fahrenheit on the convection setting if you have one. Dust the dough with flour and press out on a floured surface. Work it with your fists or toss it in the air to stretch it. Oil a perforated pizza pan. Spread the dough on the pan. 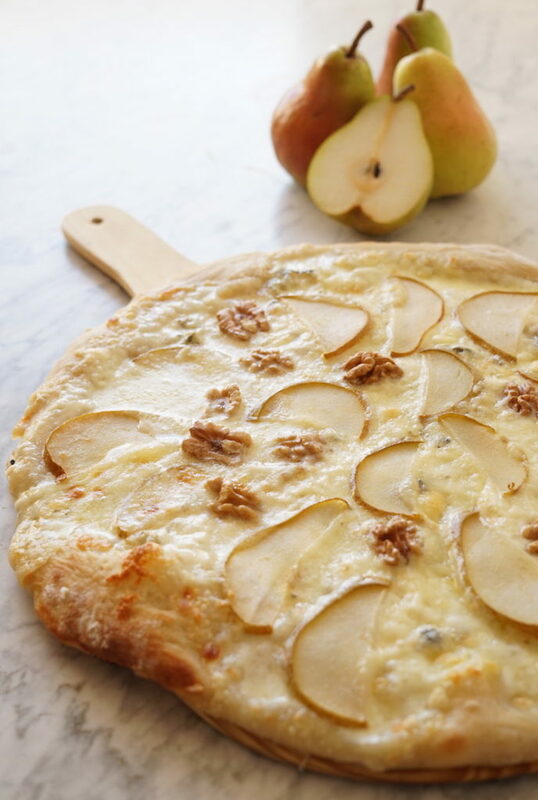 Break off chunks of the mozzarella and cover the dough, then add the gorgonzola and arrange the pear. Place the perforated pan in the oven on top of the pizza stone and watch it carefully for 5-10 minutes. When the cheese is beginning to melt but the pizza isn't totally done, bring it out and put the walnuts on top. Return to oven another 3-5 minutes until the crust is crispy and the cheese is bubbly and starting to become golden brown in spots. Remove it with a pizza peel and let it sit until it's cool enough to handle. Slice up with a pizza slicer or scissors. 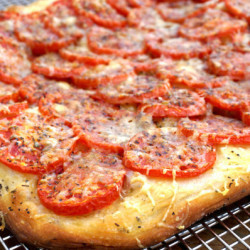 Tip: to reheat the pizza and achieve a crispy crust and melty cheese, place it on a sauté pan on medium-high heat. If you prefer for the cheese to melt even more, cover it with a lid and heat it over medium heat. Watch our quick how-to video!